View More In Tea Storage Chests. 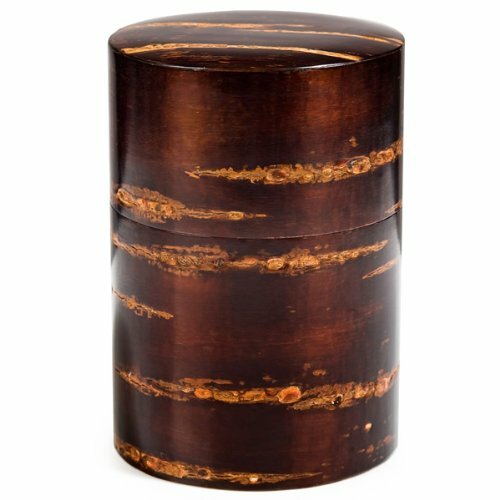 Exclusive to The Japanese Shop, the Large Cherry Bark Japanese Tea Caddy is a really beautiful Japanese tea caddy which has been hand made entirely from wild cherry tree bark. It has a matching internal lid as well as a perfectly fitting solid cherry bark wooden top which has been designed to keep your tea as fresh, and therefore as tasty, as possible. This unique range is called kabazaiku, which has flourished in Japan for over 230 years and produces products which have a high gloss, deep rich colour and are smooth and strong. We recommend the Large Cherry Bark Japanese Tea Caddy for people who really appreciate their tea and great quality traditional Japanese craftsmanship. Please note that this Japanese tea caddy does not actually contain tea. Authentic Japanese tea caddy made from cherry tree bark. Beautifully made hand crafted tea tin. Exclusive to The Japanese Shop. Absolutely no quibble, 28 day money back guarantee. If you have any questions about this product by The Japanese Shop, contact us by completing and submitting the form below. If you are looking for a specif part number, please include it with your message.